It takes full advantage of the KISS (keep it simple stupid) formula. I was lured by the inexpensive price and the curiosity factor. One sale and it is free. Once you get that, and if you are a promoter with extra credits to toss around, this should surprise you. I've sent under 5K banner impressions(and quite a few banner impressions). And have already made three sales! Considering it is a pass up system, that means I've made more than three sales. I've been wanting to try it in clixsense, because it could be very lucrative there. Especially with the large block ads but funds have been restricted due to the PV debt swap so it has been on the back burner. 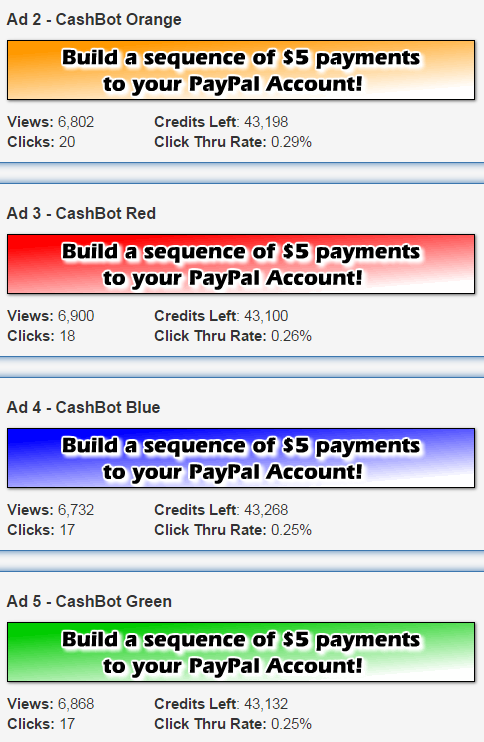 I am promoting it with my 'free' credits at paidverts and you already see the results. I think the real beneficial part of the site, which I have told one of my sign ups, is the rebate factor. Since all the money goes to us and the site takes none of it, you can rebate that cash back to the person. The key here is to get them promoting. So their first sale is a bonus to them if you rebate their cost back. Their second sale comes back to you, so you see how this can snowball. I will also post this in the downline builder with the rebate offer to anyone that joins under me. That way you can try the program for free. If you have spare credits you might be able to turn them to cash using this site. To be honest, I've never been lucky with $5-$10 matrix sites.. But if you say it works well with such small promoting.. I could give it a try.. 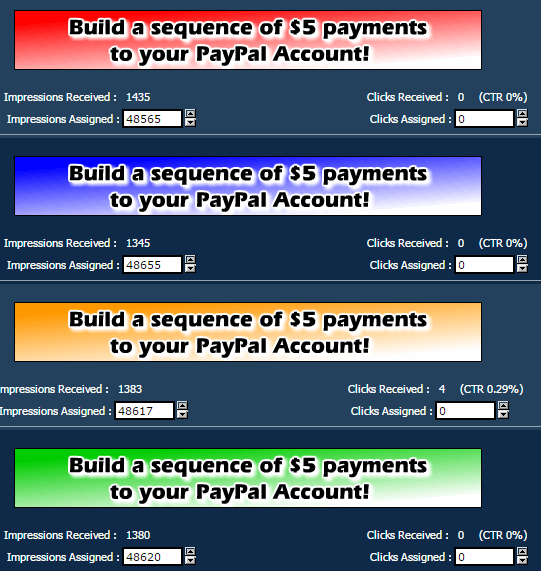 I currently have a bit over 200.000 Banner impressions resting at BoB and another 200.000 on TrafficG.. plus my site, paidverts, getref and BEMs.. so.. with the proper tools (banners).. this might actually pay something back.. now how much did incognito charge for those banners? All in all, do you think it would be worth the hassle? his 5 banner pack goes for $49 so we could get two 125 two 468 and one 728 for that. Ok, please keep us up to date with how it goes.. and we'll decide if we'll hop in. I'm willing to do a bulk ad test at CS with it. Maybe wait until I do that before we move on it. That could take two weeks to a month to start and if I get good results, I'll let you know. So, is there any update on this one or is it too early to ask? I did check another banner maker and they offered two banners for $36. They do good stuff but that is still not an expense I want to put out just now. So I am in a holding pattern for now. The cash is almost ready to do the test. Maybe I should do it anyway. Ok, I'll hop in.. I have a lot of banner impressions just waiting there, so let's see..
Btw, I've created some text based banners in 4 different colors to test-promote it for now. Feel free to use any of these and let me know if you have any ideas for some specific text or image to include in a banner. I'll now run a test with a total of 400.000 banner impressions (100.000 each) to see how people react in different colors of the same banner. I've been trying to come up with a banner slogan that gets across the idea that you can have a friend join under you, rebate him back the cash and for him it would be free and free for him to promote. I just can't think of the right phrasing though. Ok, this is going to be awkward! Well......... I think it's a good "I told you so!" time right now MM..
Something I didn't know is that by paying the $5 entrance fee on CashBot they offer a bunch of ebooks dedicated on internet marketing through several ways so there is actually some good value in what we pay for. I got a chance to download and read on one of the ebooks they offer regarding SEO and I can tell it's well written, both good quality and easy to read, so that can help both starters and more advanced users. I'll most likely download more of their stuff and share my thoughts on them. Also the BoB network seems to be great job at getting our banners clicked..
Oh, and many thanks for the rebate offer MM. You really didn't have to.. I would have recommended you to simply use the rebate amount for advertising on the ads page. So, feel free to place a banner ad there at let's say a MidTop spot for a week that equals the rebate amount. I didn't think about the ebooks because they usually aren't very helpful. I'm glad you got some value out of them. I think there are also templates that you might make use of too.